A little over a year ago, we announced that we were on track to purchase enough renewable energy to match all the electricity we consumed over the next year. We just completed the accounting for Google’s 2017 energy use and it’s official—we met our goal. Google’s total purchase of energy from sources like wind and solar exceeded the amount of electricity used by our operations around the world, including offices and data centers. What do we mean by “matching” renewable energy? 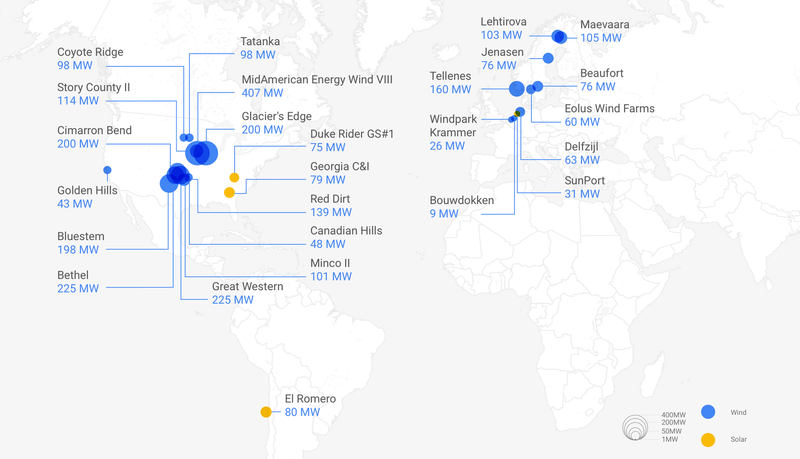 Over the course of 2017, across the globe, for every kilowatt hour of electricity we consumed, we purchased a kilowatt hour of renewable energy from a wind or solar farm that was built specifically for Google. This makes us the first public Cloud, and the company of our size, to have achieved this feat. Today, we have contracts to purchase three gigawatts (3GW) of output from renewable energy projects; no corporate purchaser buys more renewable energy than we do. To date, our renewable energy contracts have led to over $3 billion in new capital investment around the world. Google is the largest corporate purchaser of renewable energy in the world. 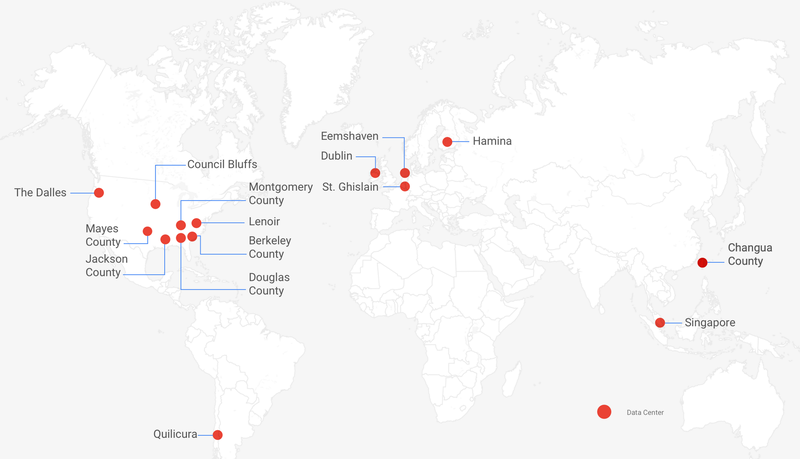 Google’s 26 renewable energy generation projects across the globe have a capacity of 3GW of total annual output. The energy consumed by our 15 data center sites, which run Google products 24/7, is matched 100% with renewable energy. We’ve been working toward this goal for a long time. At the outset of last year, we felt confident that 2017 was the year we’d meet it. Every year, we sign contracts for new renewable energy generation projects in markets where we have operations. From the time we sign a contract, it takes one to two years to build the wind farm or solar field before it begins producing energy. In 2016, our operational projects produced enough renewables to cover 57 percent of the energy we used from global utilities. That same year, we signed a record number of new contracts for wind and solar developments that were still under construction. Those projects began operating in 2017—and that additional output of renewable energy was enough to cover more than 100 percent of what we used during the whole year. We say that we “matched” our energy usage because it’s not yet possible to “power” a company of our scale by 100 percent renewable energy. It’s true that for every kilowatt-hour of energy we consume, we add a matching kilowatt-hour of renewable energy to a power grid somewhere. But that renewable energy may be produced in a different place, or at a different time, from where we’re running our data centers and offices. What’s important to us is that we are adding new clean energy sources to the electrical system and that we’re buying that renewable energy in the same amount as what we’re consuming, globally and on an annual basis. 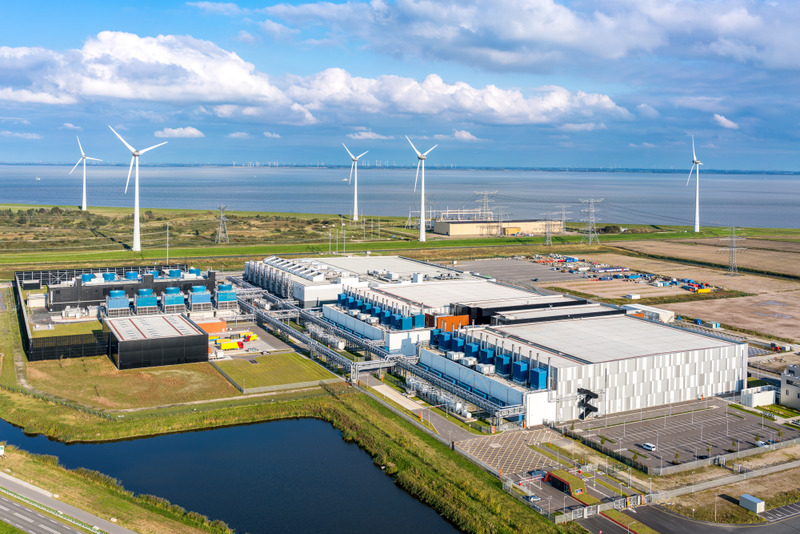 Google’s data center in Eemshaven, The Netherlands. We’re building new data centers and offices, and as demand for Google products grows, so does our electricity load. We need to be constantly adding renewables to our portfolio to keep up. So we’ll keep signing contracts to buy more renewable energy. And in those regions where we can’t yet buy renewables, we’ll keep working on ways to help open the market. We also think every energy buyer—individuals and businesses alike—should be able to choose clean energy. We’re working with groups like the Renewable Energy Buyers Alliance and Re-Source Platform to facilitate greater access to renewably-sourced energy. This the program has always been the first step for us, but it is an important milestone in our race to a carbon-free future. We do want to get to a point where renewables and other carbon-free energy sources actually power our operations every hour of every day. It will take a combination of technology, policy and new deal structures to get there, but we’re excited about the challenge. We can’t wait to get back to work.